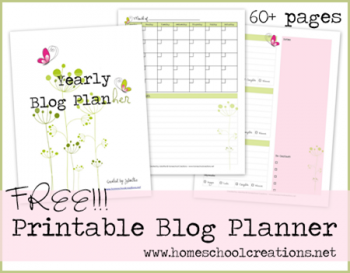 My lovely friend Jolanthe at Homeschool Creations is offering a FREE Printable Blog Planner! If you blog you’ll want to snag this free planner! Plus, it’s pretty. Thanks for this! I love some of the extras she includes like the expenses form, the link-ups, etc. Great organizational resource! Jolanthe always knows what we need and gets it done. Thank you for posting this.